I’ve had a bit of a vampire theme going on the blog lately with quite a few vampire book reviews and book blitz so I thought I would continue with the theme for this week’s Music Monday. The song I have chosen is Vampire’s Love by JRock band VAMPS. Vampire’s Love was used as the end song for the Japanese release of the film Dracula Untold and the music video was filmed in London! From tomorrow (25th February) I’m going to be taking a short break whilst I sort out my house move and various other offline things. My blog will be updated with pre-scheduled posts but there won’t be any book reviews, book blitzs/tours (other than those already scheduled) or novel posts until the middle of March. I will still be active on Twitter and Facebook, it’s just I won’t have internet access on my laptop and I find scheduling posts on my phone really tricky. So please do contact me on there or you can leave comments here as I will still be checking my blog and those I follow via the app! The sequel to Blood Echo. For Rayne Kennedy, the only Hybrid in Vires, a walled Vampire city in Vermont, life is almost over. Despite the new family and temporary happiness she’s found, her vampire girlfriend, Scarlett Pearce, has been given ninety days by the mysterious city government to turn her into a vampire. She’s sure her days as a human are numbered. Scarlett fights to find a way to avoid Rayne’s death when her father and society have decreed it must happen. Between new relationships formed, old ones reshaped, and a bloody romp through the city’s darkness, Rayne must decide if she trusts Scarlett not to give in to her blood lust. Thrown into the center of an unexpected revolution, Rayne tries to save herself and Scarlett, unsure if her days as a human, and their time being blood bound, are truly coming to an end. The Human Planets Collective sent young Ambassador Kaj Deder to the former colony planet Ostakis to establish relations. But in the twenty-five hundred years since Earth lost contact with Ostakis, the people of that colony have dramatically changed. Kaj is tasked with finding the reason for these changes while he forges trade links between the HPC and Ostakis. Without trade with the HPC, the dwindling resources of Ostakis will ultimately end human life on the planet. But his mission faces a huge obstacle in the form of Most Reverend Thyenn Sharr, the head of the Faith Progressive Church, who sees the arrival of Kaj as the beginning of the end of the Church. Kaj’s powerful attraction to Trademaster Klath’s son, Arlan does not smooth relations. Arlan Klath, the son of the Trademaster of Ostakis, bears the secret that the pious people of his planet want to hide from the homeworld and the HPC. The Curse of the Unspoken, wrought through the unspeakable acts of the First Colonists, afflicts all Ostakians, but some more strongly than others. Arlan is totally Cursed, considered born sinful and he lives without legal rights or property. He is scrutinized by Sharr who is enraged that Arlan’s father defiantly refuses to submit Arlan to a cruel act to “redeem” Arlan’s soul. The stakes increase when Arlan and Kaj form a relationship that Thyenn Sharr considers ample justification to usurp the Trademaster position through the power of his Church. Go to work. Come home. Repeat. Phil’s life is boring and he loves every second of it. No excitement, no boyfriends breaking up with him over cereal in his underwear. When everything’s predictable, nothing bad happens. But nothing good does, either. One night, when his best friend forces him to step outside of his comfort zone, he meets Shige who’s too enigmatic to really be interested in him. He’s trouble, but Phil can’t help ignoring his own advice. Decades have gone by while Shige’s kept himself locked away. He’s tired of the world, of humans and vampires. He was happy collecting dust until one day he wasn’t. On a whim, he ventures out and meets Phil, setting them on a path that’ll change them both. The Vampire’s Quest brings back the beloved gay vampires, Xavier and Thomas, in the anticipated sequel to The Vampire’s Angel. In 1822, the Archangel St. Michel orders Xavier to go on a quest to America, a quest that violates the Vampire Council’s laws to the point of a possible death sentence. Worse, Xavier must abandon his lover, Thomas. Xavier runs to his aging sister and pleads for Catherine’s help as Thomas races after them. With Thomas and the Vampire Council vying for Xavier’s soul, Xavier and Catherine struggle to obey the former priest’s divine calling before their inevitable capture. After her parents’ car crash ten years before, Amie Wentworth trusts books more than people. She may be a writer, but she believes in reality over fiction. She ignores the unexplained mysteries surrounding her, never mind the dreams of a past life, or the fact she can fry technology with a touch. Not even a timely invitation from her long-lost uncle in England gives Amie incentive for anything other than ire. Until she is stabbed in an alley and brought back to life by a handsome stranger. Soon Amie is dragged into the very sort of tale she is used to selling. To make matters worse, the man who saved her life keeps turning up and her would-be-murderer is still at large. After crossing the Atlantic to her father’s homeland, she discovers a world beyond imagining. 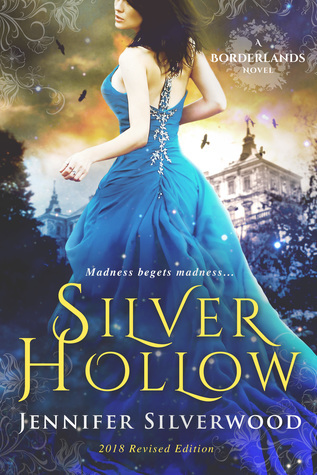 Silver Hollow is a place of ancient traditions and supernatural dangers, where everything is the opposite of what it seems and few escape sane. Faced with an impossible choice, Amie is forced to confront a deadly family legacy while remembering a life she soon wishes to forget.